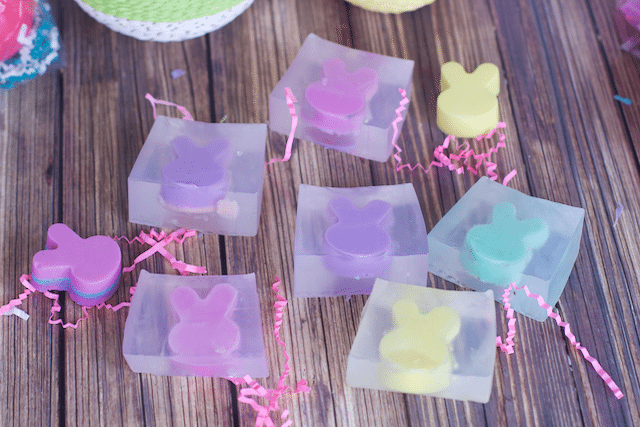 Yesterday we showed you how to make cute little bunny rabbit soaps. 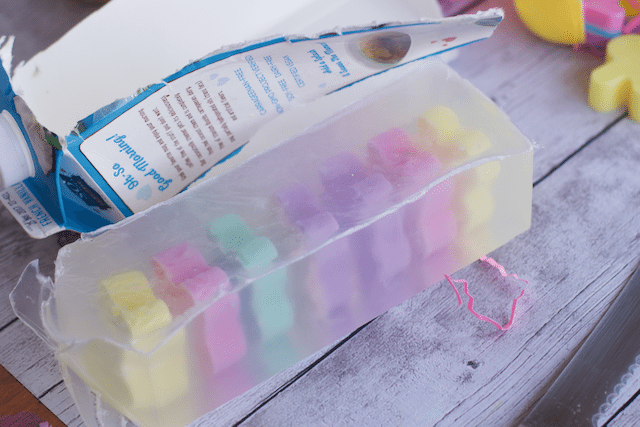 We created both layered and single colored soaps that you can easily package up for Easter Gifts for Teachers or friends. 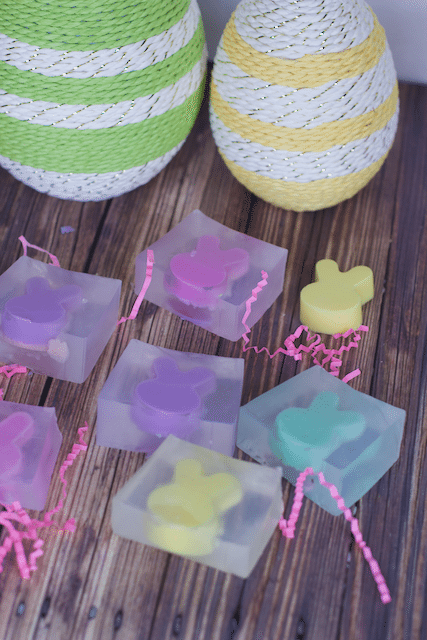 As I suggested in the post from yesterday, I decided to take these soaps up a notch and create DIY Bunny Rabbit Bar Soap Easter Gifts using the bunny rabbits. Really it does not take that much more time once you have made the first mold. 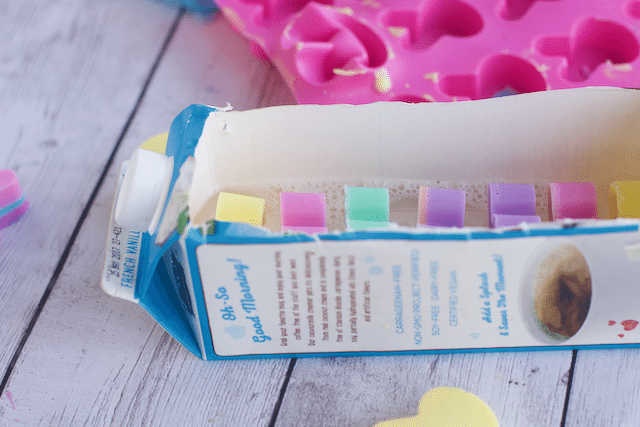 You can really reuse this tutorial for any holiday soap idea. 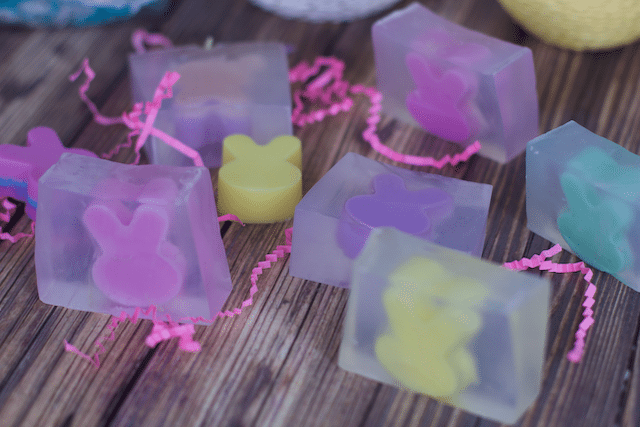 Be sure to check out our Easter Bunny Soap making post to get the first directions on making this soap. In addition to the supplies in the previous post, you will need Clear Glycerine Soap Base for these soap bars. If you don’t want to buy another mold for the bar Soap making, I cut the top of a thin milk container for my mold. 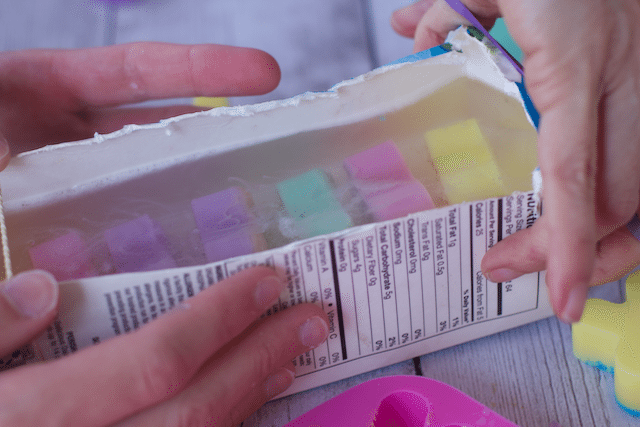 Melt the clear glycerin soap per the directions and pour a small layer into the cleaned and dry milk carton. Arrange the bunnies in the middle of the mold allowing some space to cut them if you want separate colors, or you could line them closer together and not care if you cut through different colors. Then fill the rest of the mold with more soap. The milk carton can be a little flimsy so we used some rubber bands to keep the mold from spreading too far apart. Freeze for an hour. Once the soap no longer feels warm, simply tear away the milk carton to find the block of soap. 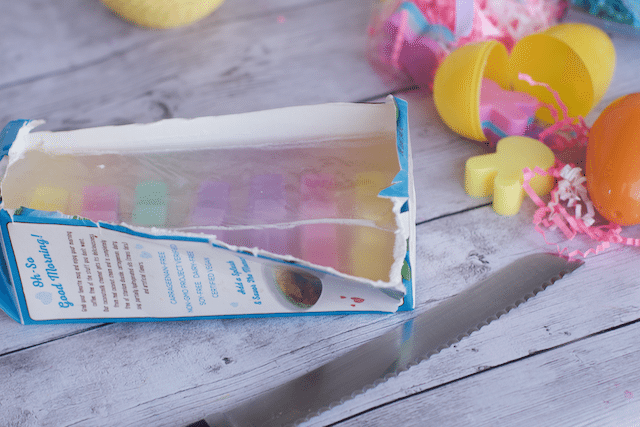 Using a knife cut your Bunny Soap Bars! I was pretty impressed with the ease of this project and the way they came out. Another great Easter gift idea! The kids had fun, and I had fun getting creative with something anyone can use. You can’t have enough soap and you can’t have enough Bunny soap either! 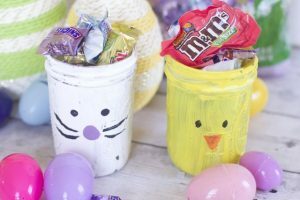 Be sure to pin this to remember how to make this fun Easter Craft! 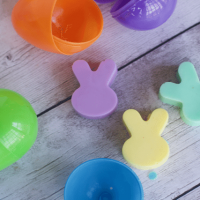 These DIY Bunny Rabbit Bar Soap Easter Gifts will be a big hit. I know it just about the soap molds really. I actually made these last year for friends and family. 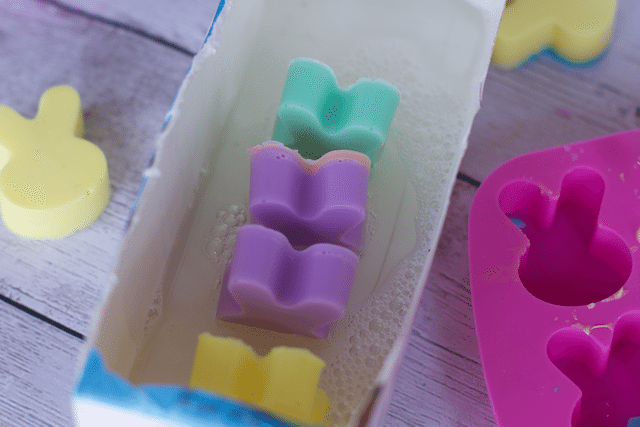 It’s amazing how easy it can be to make soaps right at home. These are so cute. My kids would love bunny soap and they would make such great gifts. What a clever idea. Thanks Lisa, it was fun to make too. 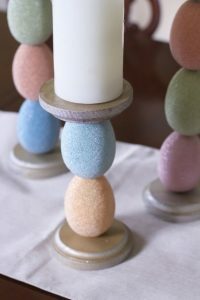 How fun and cute are these?What a perfect thing to make right now. This bunny soap turned out super cute! 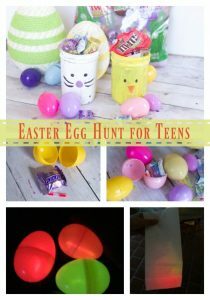 Great for tucking in those Easter baskets in a few weeks! These soaps are so cute! 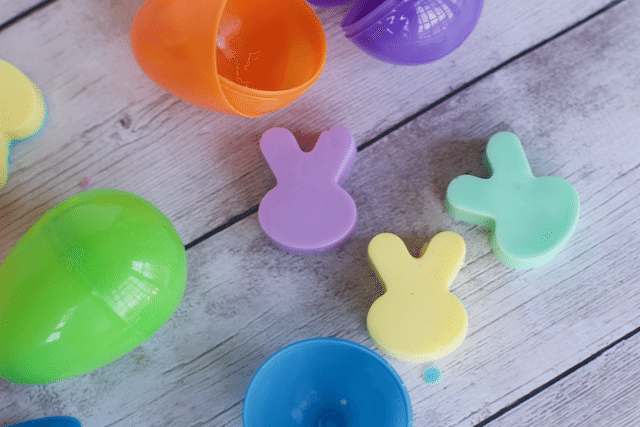 I love the little colored bunny mold in the middle. If I were to make these, I’d probably add a scent, like essential oils of either lavender or a citrus mix. Oh these are the coolest. I definitely think they’re going to be great for Easter baskets. Awesome diy project! I love making my own soap, and those are just the cutest. My kids would love finding one of those in the shower. These are such cute gift ideas! I know what my girls and I will be doing at our next Girls night! Arts and crafts and soap-making! What a sweet gift to share with some bunny this Easter. Love that you can make a bunch at once. That certainly will help make it easier on the clock and the budget.